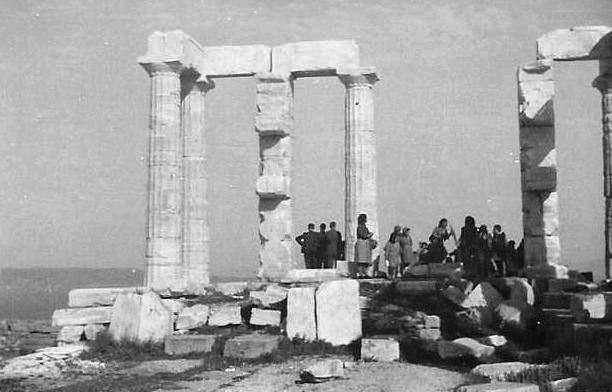 Although the date of Ray's entry into Greece is unclear, it may well have been during the period that he was in Italy, it seems unlikely that it was prior to that. It is clear that in the course of his duties he travelled between Italy and Greece during this period. The Greece was invasion of Greece by Nazi Germany in April 1941. It followed a previous, unsuccessful Italian invasion known as the Greco-Italian War. It is usually distinguished from the Battle of Crete that came after mainland Greece had been subdued. These operations were part of the greater Balkans Campaign of Nazi Germany in World War II. At the time of the German invasion, Greece was already at war with Italy, following the Italian invasion on 28 October 1940. Greece successfully defeated the initial attack and the counter-attack of March 1941. When Operation Marita began on 6 April, the bulk of the Greek army was on the Albanian border, from which the Italians were trying to enter Greece. German troops invaded through Bulgaria, creating a second front. Greece had already received a small reinforcement from British Empire forces in anticipation of the German attack but no more help was sent after the invasion began. The Greek army found itself vastly outnumbered in its effort to defend against both Italian and German troops. As a result, the Bulgarian defensive line did not receive adequate troop reinforcements and was quickly overrun by the Germans who then outflanked the Greek forces in the Albanian borders, forcing their surrender. The British Empire forces then performed a tactical retreat with an ultimate goal of evacuation. The German army reached the city of Athens on 27 April and Greece's southern shore on April 30, capturing 7,000 British Empire forces, and ending the battle to their complete victory. The conquest of Greece was completed with the capture of Crete a month later. Following its conquest, Greece was occupied by military forces of Germany, Italy, and Bulgaria. Looking back near the end of the war, as Germany's inevitable and impending defeat loomed ever closer, Hitler attributed great blame to Mussolini's Greek fiasco as the cause of his own subsequent catastrophe. As an explanation of Germany's calamitous defeat in the Soviet Union, this had little to commend it. It nevertheless had serious consequences for the Axis war effort in north Africa. 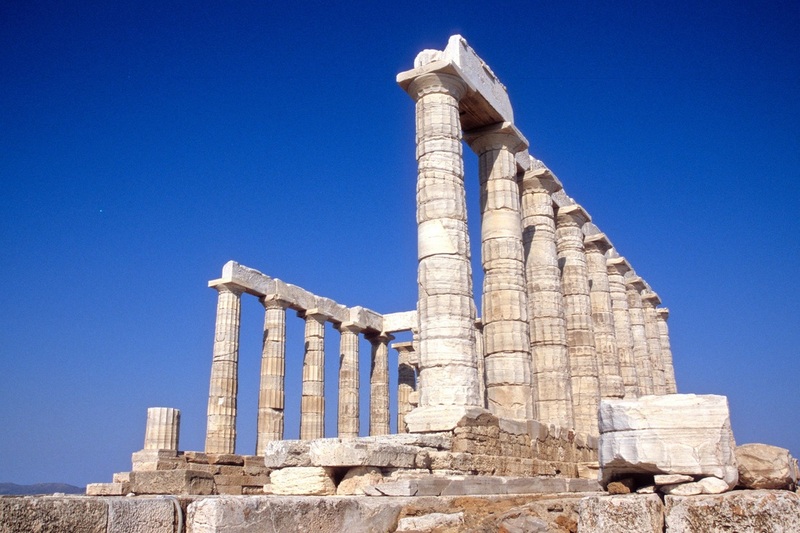 While stationed in Athens, Ray found time with others to make a trip to the Temple of Poseiden at Sounion 43 miles SE of Athens. 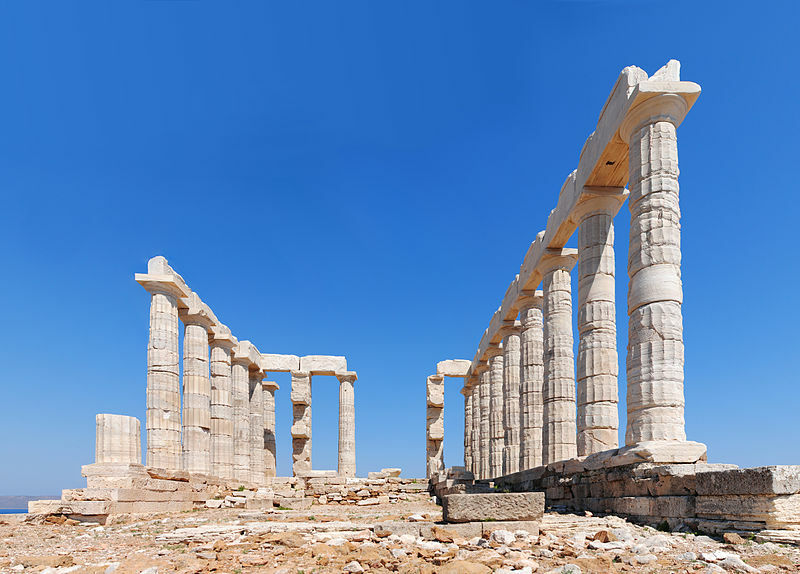 According to Greek legend, Cape Sounion being the place where Aegeus, the king of Athens, leapt to his death from the cliff, thus giving his name to the Aegean Sea. They travelled there in a captured German air cooled Daimler car which was being used by the mess in Athens. En route to the Temple of Sounion with others in the Daimler. 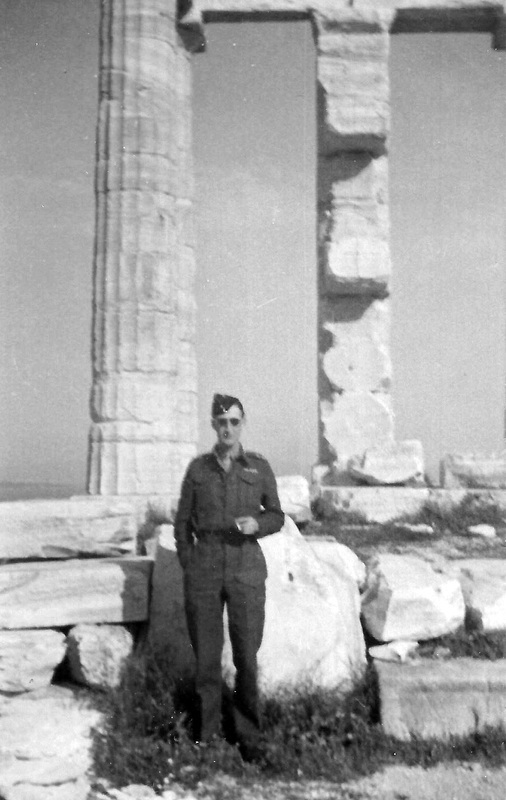 Ray at the Temple of Poseiden at Sounion in 1945. Ray's photo of the view from the Temple. 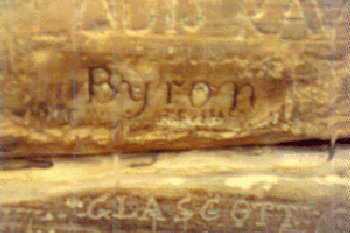 The poet Lord Byron's name is carved into the base of one of the columns of the Temple of Poseidon, the graffito possibly dating from his first visit to Greece, before he acquired fame. 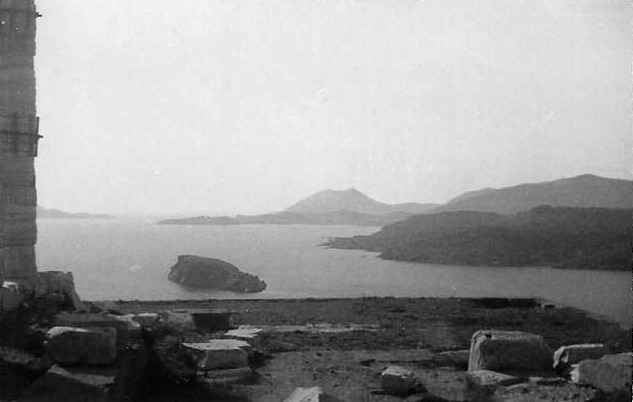 Byron spent several months in 1810-11 in Athens, including two documented visits to Sounion. Ray's photo of the Temple. Note that the modern photo below shows that the temple has been restored, some fallen columns having been re-erected. 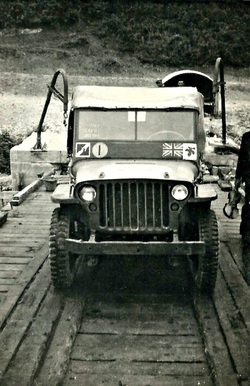 Ray's jeep on the ferry crossing the River Struma near Thessaloniki. 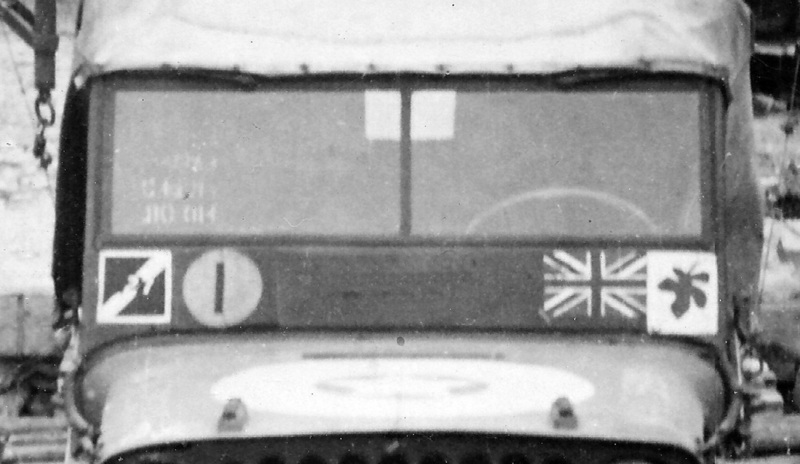 A closer view of Ray's Jeep showing it's markings. An embroidered badge of 3 Army Corps. - Bridge plate - used to categorise vehicles so that guards on bridges could stop traffic that was too heavy for their bridge. - 3 Army Corps insignia. 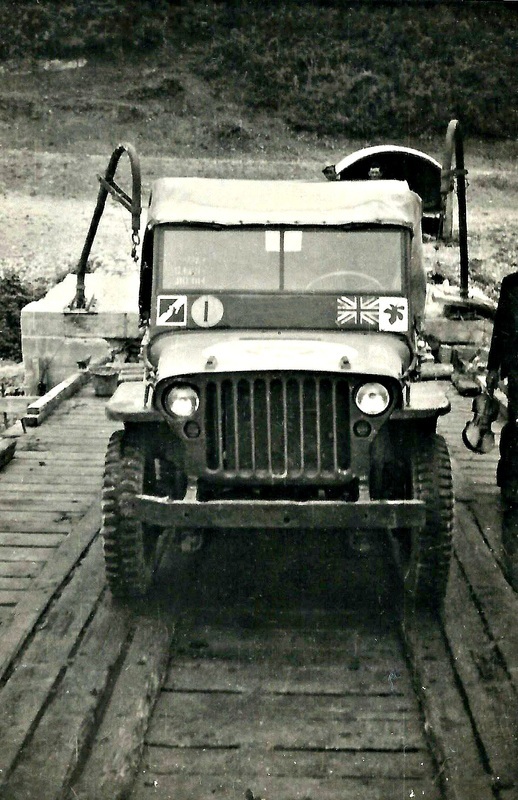 There also appears to be a US star in a circle painted on the bonnet. On a side note, Ray was incredulous and completely astounded to hear when it was made public for the first time in the 1970's of the work of Bletchley Park in breaking the Enigma codes and reading the German's radio traffic. He, like so many had no inkling that so much intellience was obtained from that route in such a secret way. The revelation put into context some of the events he had been involved in such as the German invasion of Crete in 1941, where Enigma sourced information gave advanced warning of the praratroop attack but as no possible second source of this information existed, to protect the source no additional defensive steps were put in hand and Crete fell to the Axis forces.